The kangaroo eventually hopped away to safety, but not before Australia's famed Bathurst 1000 car race was briefly paused. 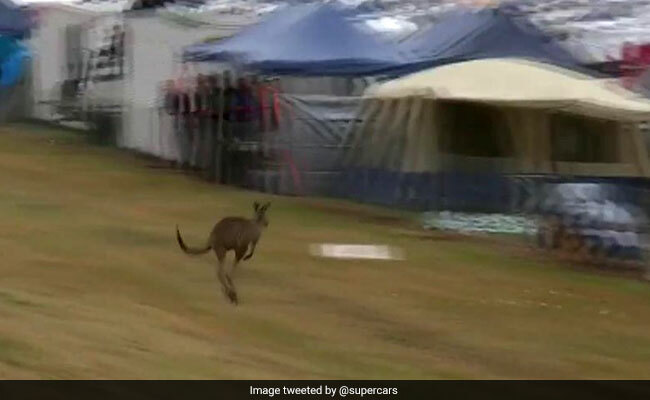 A kangaroo found its way to Australia's iconic Mount Panorama race car circuit on Sunday and instantly caught the attention of the Internet. Though the kangaroo managed to steer clear of the actual race track, it hopped along it. The marsupial's presence meant a safety car needed to be deployed to ensure the safety of the kangaroo as well as the race car drivers and spectators. A safety car is usually sent out to slow down race cars. The Bathurst 1000 is a 1,000-kilometre car race held each year on the Mount Panorama circuit in Bathurst, Australia. It's known as one of the country's toughest motorsports events. "Skippy, you can have the Mountain back tomorrow. We have a race on today!" tweeted the official Supercars handle as videos of the rogue 'roo flooded social media. Skippy, you can have the Mountain back tomorrow. According to local media reports, kangaroos are a regular fixture at the race track. Good to see Skippy make his annual appearance @ the #Bathurst1000. Makes the race a little more Australian.